implementing HTTPS everywhere on your site. Businesses are constantly looking for new ways to make their company stick out—whether that’s in search engine rankings or in their customer’s minds. And with Google’s recent announcement that HTTPS everywhere is a factor in their ranking algorithm, SSL can be part of your solution. Using SSL across your site puts your company above your competitors in search rankings and boosts traffic to your site. It also increases user trust and on-site user engagement. Prepare your company for the future; give it the edge it needs to be a step above by enabling site-wide SSL. Having HTTPS everywhere on your site helps marketing initiatives in more ways than you may think. SSL Certificates are a proven method of encryption and authentication and many users immediately recognize them to mean security. Between the search engine ranking boost and the effects of increased user confidence to your brand, SSL is sure to make a huge difference to your company. Sites with SSL enabled across their entire domain are getting an SEO rank boost from Google; and this boost is likely to increase in the near future. Keep your business a cut above the competition with site-wide SSL. Most businesses can’t afford the astronomical cost of a data breach—no matter what user information is leaked. Protect your users’ data and your brand’s reputation by securing all data that is transferred on your site. Online consumers know SSL means security. When a user sees an SSL Certificate on your site, they know you are a legitimate company and your identity has been verified. They also know their information is safe in your hands. When users feel safe on your site they’re more likely to stick around. Engagement metrics like time on site, bounce rates, and shopping cart abandonment are all affected by user confidence. What Kind of Certificate Should I Use? EV SSL Certificates were specifically created to boost customer confidence through a rigorous verification process and specific, EV-only browser cues like the green address bar. According to a recent study by Tech-Ed, 100% of participants would prefer doing business with a company that has an EV SSL Certificate. DigiCert recommends an EV SSL Certificate to companies looking for more than just encryption out of their SSL Certificate. EV certificates are proven to increase conversion rates, improve engagement metrics, and elevate brand reputation. Q: What about site performance? ANSWER: Previously, some companies were worried that adding SSL to their sites would negatively affect page load time and thus search engine ranking. This concern came from the additional complexity of the SSL handshake and certificate revocation checking while the page is loading. And while it’s true that Always-On SSL can cause some network latency; this concern can be mitigated if you think about performance when making the switch. Choosing your Certificate Authority carefully is one of the biggest factors in preventing performance degradation. Though there are many factors to think about when choosing a Certificate Authority, if you’re worried about performance, revocation checking (OSCP response time) is the most important metric because it has the biggest influence on page lad time. With DigiCert, you don’t need to choose between security and speed. 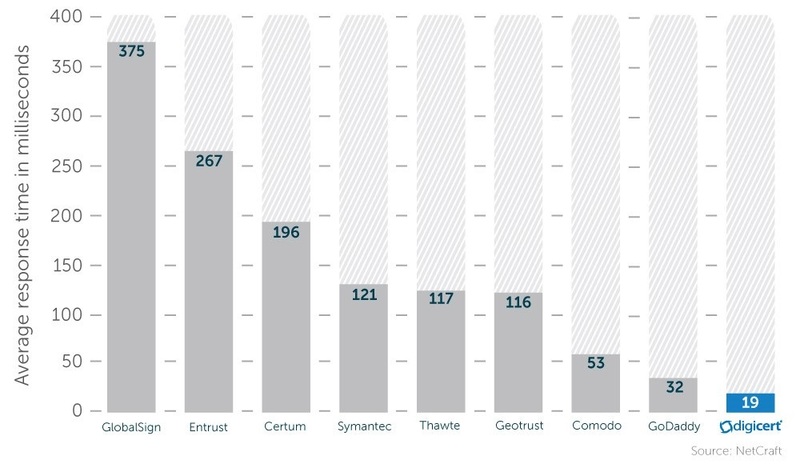 Our OCSP response times are over 4x times faster than our competitors', making our certificates the clear choice for performance-minded companies. Q: Doesn’t SSL cost a lot? ANSWER: Other companies were worried about the increased price of adding SSL Certificates to their entire website. However, for single-domain sites you only need to purchase one certificate. DigiCert’s EV SSL Certificates can be used to secure your entire domain with the same level of encryption and user trust. For larger companies with multiple subdomains or even multiple domains, a Wildcard or Multi-Domain SSL certificate may be a good fit. These certificates are a cost-effective way to secure multiple subdomains or domains with a single certificate. Q: Will I need to buy more hardware or equipment? ANSWER: Some IT organizations may be worried that Always-On SSL will be computationally expensive, increasing operational overhead costs and hardware requirements. However, due to improvements in server computing power this is no longer an issue. When Google turned on HTTPS everywhere, their researchers performed extensive tests and determined that even for their high-volume site they did not need any additional machines or special hardware.